I had my new nephew, Michael Logan over this weekend. He's nine years old and a real "good egg". I asked him if he was into toy soldiers as we walked out to the Toy Soldiers Forever! studio. He replied that he really liked LEGOS (which I knew) but seemed a little tentative about toy soldiers. 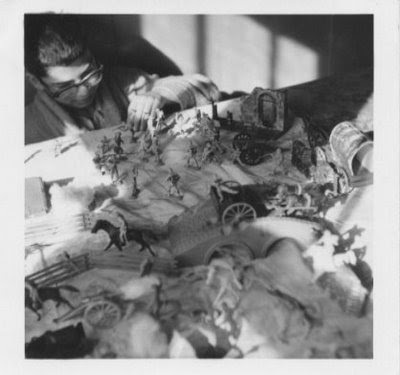 Once in the studio, Michael was rapt at being surrounded by zillions of soldiers filling shelves and surfaces. He had plenty of questions especially about my home-made pewter soldiers. By the time we got back up to the house he had a new interest and I had a Toy Soldiers Forever! ammo chest for him filled with BMC figures. he was off and running setting up his own battles. With each scenario he'd ask Susan or I which battle it looked like. "Malvern Hill" I'd say, "because the Yankees have all the cannons and they're on the high ground." It quickly became clear to him that there was some method, as well as history involved. He was really having a very good time. He'd ask our opinion of his various scenarios and wanted to preserve them in pictures. Later that afternoon Susan brought him out to Antietam and with my employee discount I was able to load him up with the BMC/Americana Dunker Church and Burnside Bridge, both of which come with more soldiers. He got loaded up with reinforcements and I got off really cheap! Seems to me the hobby continues in new and enthusiastic hands. No sooner had I learned the disconcerting news that future releases from Cunnyngham Collectables are in Limbo and that their much anticipated Union Infantry are not as close to release as everyone had thought, I got distracted by stumbling upon some really nice dismounted cavalry figures by Paragon Scenics. I guess it's true, when one door closes, tiny cavalrymen kick open another door. Thanks mom. Paragon, who knew? I'd never heard of them before. Much like Cunnyngham, they seemed to sprout up like mushrooms after a spring rain, and, like Cunnyngham, I'm very pleased to make their acquaintance. In two sets of dismounted cavalry there are twelve figures each of six poses, included are a few interchangeable heads, arms, etc. They depict US Cavalry of the post Civil War era of genocide against Indians, which frankly, I was never into even as a kid. But despite the trapdoor Springfields and later model army Colts, in rich medium blue, they'll work just fine as Yankee cavalry, and I'm always on the lookout for reinforcements. The sculpting, detail, and animation of these figures are absolutely superb and the variety of poses provides a great deal of flexibility for any tabletop battle scene. This trooper's trapdoor easily passes as a Sharps for my purposes, and when the lead is flying no one will be able to get close enough to tell the difference. Here's a bunch of firepower, all beautifully rendered in 54mm. This corporal is one of the few troopers in either set sporting a kepi, which is unfortunate, though I will be making a stab at modifying some of those campaign hats into kepis... yes, I'm pretty confident that I can pull that off. Fodder for a future post perhaps. This is obviously a "Custer's Last Stand" type idea here, and these fellows are pretty fixated on their six-shooters, which is fine, I guess, though I prefer carbine action for my battles. Even this cool cat bugler takes five on his axe to get off a few rounds in the direction of some critic from Downbeat. The sculpting is so fine that it's pretty obvious that this is a post-Civil War revolver, exactly the reason I don't let the hard-core purists come over to my house to play. Similarly, interchangeable heads allow a different look for the prone shooter, either kepi or campaign hat. I really could have done with more of these heads, especially with kepis. Here are all twelve figures from sets one and two. A very nice grouping, all firing and one wounded. All twenty-four figures is a mighty formidable phalanx of fighting ferocity. For as thoughtful and well-sculpted as these artful figures are, the box art is strictly third-rate. The box art was obviously an afterthought. So, Paragon has really hit this one out of the park, my only real complaint is that the plastic is a little brittle and details like gun barrels and swords don't look like they'll take much play. Otherwise, I really like these figures from the fine sculpting, to the dynamic animation and anatomy, the high attention to detail and best of all the beautiful medium blue of the plastic, make these figures a must for any ACW play. More good news - according to the Paragon website, they'll have a set of mounted cavalrymen ready for release by May of this year; here's hoping. enter our friends from Toy Soldiers of San Diego with some outstanding dismounted cavalry of their own. I'm so happy to see TSSD utilizing medium blue, that light blue they frequently use makes their Yankees appear to be on their way to a baby shower rather than a battle. This trooper firing prone is remarkable detailed with spurs, and a nice sharps carbine. Like all TSSD figures he is robustly sculped without sacrificing really nice detail. This casualty figure is also quite outstanding. Most toy soldier companies are very much like the Veterans Administration during the reign of George W. Bush in that they generally limit their time and attention when it comes to the dead and the wounded. Leaning against an oversized gabion, this wounded trooper waits for first aid. Is that Donald Sutherland, by the way? Here, Charleton Heston awaits confiscation of his pistol. This figure provides us with a soldier in his undershirt, something rarelyseen in toy soldiers. Something else I realy like about this latest batch of TSSD figures is the anonimity of the figures; their earlier, more character-driven figures are often a little distracting, something I discussed in an earlier post. Note the tatters in the front; from wear or gunfire? The package art is quite nice, though only on a simple hang-tag. Combined with the paragon figures the TSSD troopers provide welcome reinforcements. Paragon at top and TSSD below. Here you can see the robustness of the San Diego casting. I continue to be impressed by the quality of their work and their prolific releases. So that's the review, now its time to put thise guys in action. A thin column of union Cavalrymen made a desperate stand outside Greenbrier maryland in an attempt to keep advancing rebels out of tiny Unionist Boonsboro. Despite rapid fire and strong position, they realize the gathering hosts of sessionists will surely sweep them from the scene. Horse-holders in the rear watch helplessly as comrades fall to the bullets of the Southron scoundrels. Casualties mount, though no man will slaken fire or shirk, rather they simply shoulder up to the man next to them and await fight to the last bullet and the last man. As the bodies of comrades crumble all around him his revolver advances the last round to the waiting hammer, just as he squeezes the trigger he finds it odd to hear thunder on this cloudless day, but then he hears the unmistakable sound of a distant trumpet as the thunder grows louder. Not a quarter a mile away the trumpet sounds again as mounted reinforcements thunder to the scene. Thundering across the bridge the lead elements can see the smoke of their beleaguered comrades in the near distance. In a race to the rescue the speeding horses' hooves spark against the stone bridge roadway. Riders begin firing at longer ranges as the Rebel ranks only begin to realize the threat to their flank. The mounted vanguard breaks through the treeline as the desperate remnants of Troop A realize their deliverance is at hand. Horsemen choose their shots over the heads of the thinned though undaunted ranks of their comrades afoot. Wounded men shelter under the trees as galloping horses snort by. A ripple of hearty "Huzzahs" ring down the line as the pressed men realize the moment of their deliver is at hand. Troopers spring from the saddle and quickly augment the firing line, shouldering in among the stalwart survivors. The increased rate of fire is staggering to their foes as round after round is chambered and launched toward the sons of the Southland and slavery. After a few quick volleys, all that can be seen through the smoke and dust are the backs of the fleeing rebels. Once again the day is saved by the timely arrival of our dauntless dragoons. "Lincoln and Union Forever!" is the cry that issues forth from the lips of the triumphant horsemen of the North. It goes on like this all the time around here.